Bedrooms: 2, bathrooms: 2, sleeps 6. 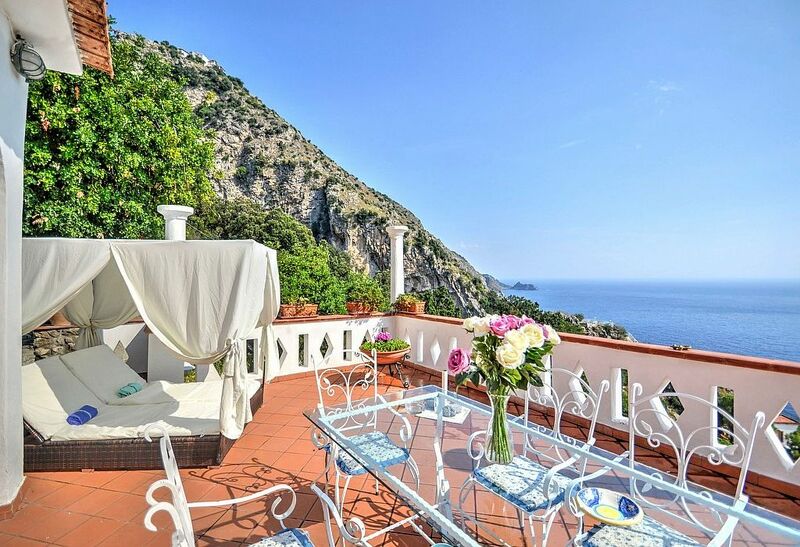 Appartamento Annarosa C is a splendid and luminous apartment that covers the entire first floor of a villa built on the sloping cliff in front of the sea. It sleeps six people. From Appartamento Annarosa C you will enjoy a wonderful view of the sea and of the gulf of Salerno far in the horizon. Appartamento Annarosa C is 90 square meters (970 square feet). It features a wide private terrace with a view of the sea, air conditioning (please read description below to check in which rooms the units are installed), winter heating and WI-FI Internet access. You will be roughly 1 km (0.6 miles) from Praiano, where you will find restaurants and shops. You will find a grocery store, the stop for the Flavio Gioia bus interno Praiano line at 500 meters (1640 feet) and the closest beach (Marina di Praia Beach) at 450 meters (approximately 490 yards) including 236 stairway steps. You will reach Appartamento Annarosa C from the street level along a 500-meters (1640-feet) public walkway that cuts through a courtyard and includes approximately 140 stairway steps. You will not need a car to stay at Appartamento Annarosa C. If you do have one, you will be able to park it in the village, for a fee, in a parking lot (where a space can be reserved). Appartamento Annarosa C is one of the holiday homes available in a small complex (you can find these holiday homes on this website). Please find a general description of the complex below, and please scroll further down for a description of Appartamento Annarosa C.
This large villa, built following the contour of the rocky coastline, is divided into four apartments. Each apartment covers an entire floor of the villa, and has its own independent entrance and a panoramic terrace. The villa is on the edge of Praiano, between Positano and Amalfi, just on the famous beach of La Praia. You could reach the seaside from a flight of stairs that starts from the house and leads you directly to the beach. From the terraces the sight is terrific: the wide view of the emerald sea will enchant you and give a magic emotion that you could hardly forget, the steepy slopes that meet the sea gives the impression of a pristine landscape. The villa is in the pedestrian precinct, crossed by an old street that leads you to the heart of the little town of Praiano.You&#39;ll enjoy the old fashioned shops, the typical fishermen&#39;s houses and the real way of life of the people of Praiano, a jump into an old way of living that will delight you. Shops are really close at hand, and if you want to try the classic Fish-based cuisine of the Praiano cooks, famous all over the world, you only have to choose one of the different restaurants and taverns in the little town. The terrace is 90 square meters (970 square feet) large. It is partly shaded by a porch. It is equipped with a table, chairs, a sun umbrella, sun loungers and a gazebo. From the terrace you will enjoy a wonderful view of the sea and of the coastline. The living room is paved with handmade majolica tiles, in the characteristic style of the Amalfi Coast. The furnishings are classic and welcoming. The furnishings include two armchairs and a divan that unfolds into a double bed. The dining table can accommodate four guests. In this room you will find a satellite television (local channels). From the living room you will be able to enter the terrace through a French door. The room also has a window. It is equipped with an air conditioning/heating unit. You will be able to enter the kitchen from the living room through an arched opening. It is equipped with a three-burner electric cooker, an electric oven, a refrigerator with freezer, a microwave oven and an Italian-style coffee-maker. Here you will also find a washing machine. The kitchen has a window. You will be able to enter the first bedroom from the living room. The bedroom has a matrimonial bed (160 cm/62 inches, wider than a queen-size bed). The furnishings include a bedroom chair. From the bedroom you will be able to enter the terrace through a French door. The bedroom is equipped with an air conditioning/heating unit. You will be able to enter the second bedroom from the living room. The bedroom has a matrimonial bed (160 cm/62 inches, wider than a queen-size bed). The furnishings include a bedroom chair. From the bedroom you will be able to enter the terrace with a view of the sea and of the coastline through a French door. The bedroom is equipped with an air conditioning/heating unit. The first bathroom is tiled with lucid handmade majolica tiles and equipped with a washbasin, a toilet and a fully enclosed shower. You will be able to enter the bathroom from the living room. The second bathroom is equipped with a washbasin, a toilet, a fully enclosed shower and a hairdryer. You will be able to enter the bathroom from the living room. We loved staying here! Perfect amount of room for a family of five and the outdoor patio can't be beat. The kitchen was equipped with everything we needed and the two bathrooms were so nice for a family our size. We hope to be back soon, Praiano is a beautiful town! We loved the spacious setting, the incredible views and peace and quiet away from the main Amalfi Coast road. The terrace and view was the highlight that we kept coming BACK to enjoying our evenings on the terrace - with our home cooked pasta meals made from fresh local ingredients from Mini Market Tutto Per Tutti. Can’t recommend this place enough or our host - enjoy! You have to have a responsible level of fitness given the walk and steps from the main road - for us this made it even more of an adventure. Our host Pierluigi [the caretaker] was fabulous, friendly and couldn’t have been more welcoming and helpful! Summer In italy superbly helpful! Easy to review property availability and book online. We’d definitely use Summer In Italy again to book. Appartamento Annarosa C was very clean and spacious. Large enough for our family of 6. We had all the amenities we needed at the apartment and the views from the terrace were amazing. The kids enjoyed the canopy bed on the terrace and we loved eating outdoors on the terrace. We had a lot of privacy which we loved. Pierluigi [the caretaker] in Praiano was a wonderful host and so very helpful! We could call him for help and he was so very nice to assist us! We will definitely use Summer In Italy again. We were very happy with the service. Everyone at Summer In Italy was great to deal with, they are quick to respond to any inquiry and very detailed with all information about the apartment. Thank you! We had a lovely time, the location is ideal and the view is stunning. Appartamento Annarosa C exceeded our expectations. An amazing view from the terrace!! Summer In Italy were extremely helpful and knowledgeable. I look forward to planing another trip with them in the future! The rental price includes: electricity; linens; towels.Available upon request: baby bed. To be paid at the property:final cleaning EUR 150.00.Available for a fee, if desired:baggage porter.